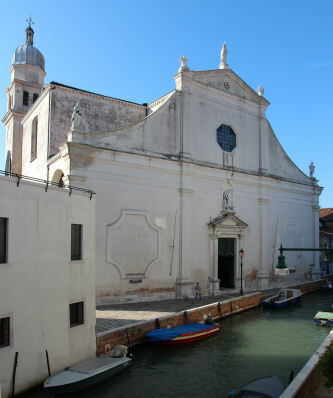 Tradition has it that this church, dedicated to the Archangel Raphael, is one of the oldest in Venice, supposedly having been founded in either 416 or 650. The latter date attaches to the legend that it was the second church founded by San Magno (Saint Magnus). Another story says that when Attila attacked Italy for the second time Genusio, Lord of Padua, sent his family to the island of Rialto. When his wife, Adriana, arrived in Dorsoduro she vowed to build a church if her husband retuned safely. She built an oratory where the Bendictine nuns from San Zaccaria, whom she had befriended, could visit and worship. Adriana left the oratory to the nuns, who kept it up until it was destroyed by a fire which swept the whole district in 899. The church was rebuilt by the Candini and Ariana families. It became a parish church, which was destroyed by fire in 1105. The first written record dates from 1193, the year in which the church was rebuilt and reconsecrated following the fire. This church was itself demolished in the 17th century, being considered to be beyond repair. The current church was built in 1618-1639 to designs by Francesco Contino, with further work in 1676 and 1685. 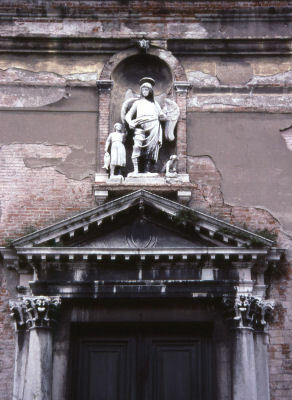 The façade, facing onto a narrow canal, was rebuilt in 1735, with its statue group of Tobias, Raphael, the dog and the fish (see below left) dating from this time too, and said to be by Sebastiano Mariani. The restoration of the façade in 2004 left it looking like new but lacking, some complained, that certain crumbling charm that it possessed before (see above right). But the pristine look didn't last, of course, this being Venice. 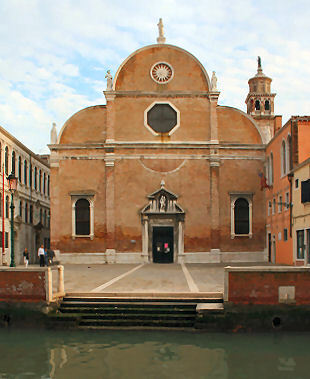 This is one of only two churches in Venice that are free standing, i.e. you can walk all around them. The church has its original Greek-cross interior, which was reworked in the 18th century and is given a warm glow inside by the orangey net curtains. The 18th century art here holds little to surprise, and of course there's one by Palma Giovane.. The organ over the entrance (built 1743-49 by Antonio and Tommaso Amigoni) has a balcony divided into five sections, each featuring somewhat feathery but strongly coloured paintings of The Life of Tobias by Giovanni Antonio Guardi (the elder brother of the more famous veduti-painter Francesco) in 1750-53. There's a central ceiling fresco by Francesco Fontebasso a pupil of Ricci and Tiepolo (see photo below) which is a bit darkly out of tone, but impressive. And in the baptistery (entrance to the right of the high altar), a tiny low room, the whole ceiling of is covered with a fresco, also by Fontebasso. It's been much altered, but recent cleaning has left it maybe a little too vivid. Rebuilt with the 18th century's favoured form of the octagonal drum and onion dome. This church is central to the action in Salley Vickers' novel Miss Garnet's Angel and so it has become something of a pilgrimage destination for fans of that book. This possibly explains the much better chance that you'll find it open in recent years and the spate of sprucings-up after the book was published. Founded in 1286 by the Carmelite fathers, an order of desert hermits originally centred around Mount Carmel, and finally finished and consecrated in 1348. In 1515 there was a major modernisation of the interior, and a new campo façade created, by Sebastiano da Lugano. The adjacent monastic buildings were also rebuilt early in the 16th century. The brick façade facing the square and the canal is early Venetian Renaissance and influenced by the work of Codussi. The façade is by Sebastiano Mariano di Lugano, as are the statues, probably. The statues are, from the top, the redeemer, the annunciation and the prophets Elijia and Elisha. The last two are considered to be the founders of the Carmelite order. The doorway has an unusual double pediment. The side entrance on Calle de la Scuola with its very projecting canopy (see right) is the original 14th century façade and features Byzantine palm-leaf detailing. It was restored in 2006 by Venice in Peril. The form of the interior dates from the original 14th century Gothic building, but most of the decoration is later. The impression on entering is of vast length. There are twelve columns down each side, with gilded statues in each of the spandrels, much gilding of the arches, and a frieze of of paintings by late-17th and early-18th-century painters you won't have heard of. The church has no transept but has odd big singing galleries suspended either side of the apse entrance. The apse retains something of the appearance of the 14th-century church and the sacristy has 14th-century fresco fragments. 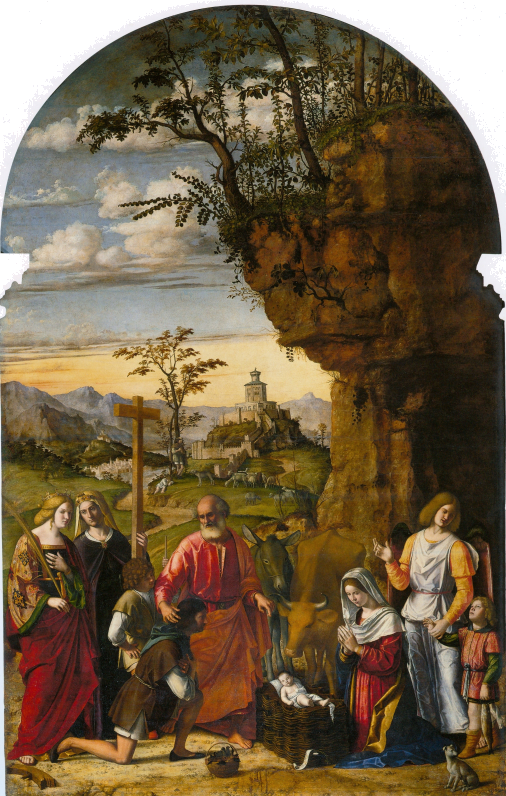 The second altar on the right has a 1509 Adoration of the Shepherds by Cima da Conegliano (see below right) which is one of his best, with the figures not looking like plastic shop dummies, as his so often do. It's also unusual in including Tobias and the Angel amongst the attendant saints. The dog bears a striking similarity to the one in Titian's Tobias and the Angel Raphael, now in the Accademia. 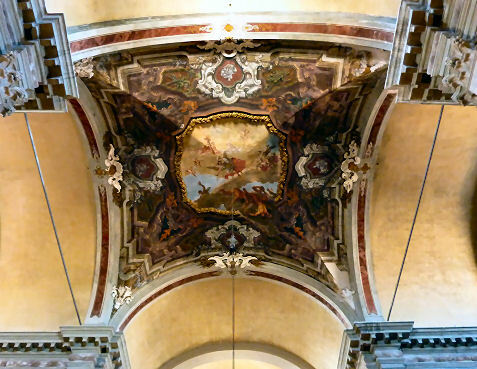 The third altar on the right is the only one decorated up into the dome above, with a sparkling fresco depicting Two angels in flight by Sebastiano Ricci. The fourth altar, the Altare dei Compra Vendi Pesce, has an early Presentation by Jacopo Tintoretto. Behind the altar is a copy of the central part of Titan's famous Assumption from the Frari, made by a painter called Tagliapietra in 1856. Hanging above the altar is a painted wooden crucifix said to be by Paolo Veneziano. In the left hand aisle the second altar has Lorenzo Lotto's Saint Nicholas in Glory, with Saints John the Baptist and Lucy, painted for the Scuola dei Mercanti in 1529 and still in its original Istrian stone frame. It was Lotto's first public commission in the city of his birth. On a visit in October 1891 the art historian Bernard Berenson, his wife Mary, and their friend Enrico Costa washed this painting 'at the invitation of the sacristan', it having been 'invisible under candle-grease, dust and cobwebs' according to Mary. The effect of Saint Lucy's eyes floating above the chalice at her feet is very odd and frog-like. Saint George fights the dragon in the impressive Flemish-looking landscape below. To the right of this painting, over the confessional, is the early, small and quite-recently-restored Holy family with the Infant Saint John by Veronese, which was previously in the church of San Barnaba. The cloister of the former monastery (see right), which was rebuilt in the mid-17th century and suppressed in 1810, has an entrance to the right of the façade. The wellhead in the centre is dated 1762 and has the Carmelite crest. The 1290 original is visible on Barbari map. It was damaged by earthquakes in 1347, 1410 and 1511, demolished in 1511 and rebuilt taller in 1520. This one began to lean as the foundations subsided and was straightened in 1688 by Giuseppe Sardi. The method by which he achieved the straightening involved digging away at the brickwork on the three sides away from the tilt and wedging wood into the holes. He then dissolved the wood away with strong acid and the tower tilted back. At this time the campanile was also topped by a small octagonal temple with a bronze statue of the Madonna of Mount Carmel. The current statue is actually a copy made in 1982 by Romano Vio after the original was struck by lightning. When the lightning struck the campanile, in 1756, the monks ringing the bells at the time were so terrified they fled in panic and one of them hit his head against a wall and died. 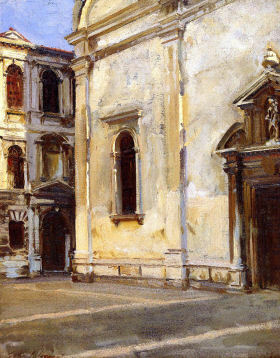 Santa Maria del Carmelo and Scuola Grande dei Carmini, a typically cropped oil painting by John Singer Sargent (see right) shows the façade stuccoed over. Sickert's oil painting The Church of the Carmine is from a viewpoint just a little to the left of mine for the photo above, and merely trims off the top of the façade. It too shows the façade stuccoed. The Scuola has it's own entry now. 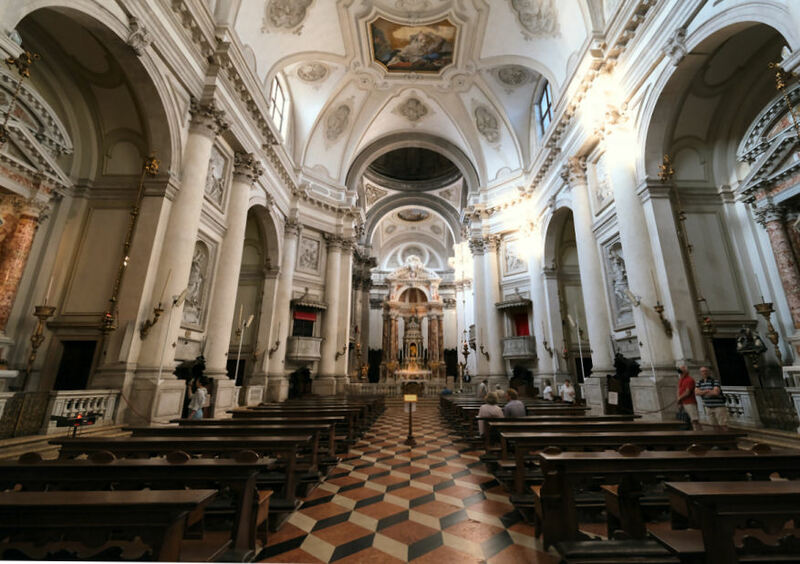 Built in 1694 by Giovanni Battista Lambranzini (who was also responsible for the nearby Santa Margherita and the modernization of the interior of Santa Marta) for observant Augustinian nuns, and paid for by Santo Donadoni and dedicated to Jesus, Mary and Joseph. The widow of Doge Giovanni Corner lived here until her death in 1729. Relics kept here included a thorn from the Crown of Thorns (on which it is said blood appeared on Good Friday), the hand of Saint Juliana and several bodies of saints taken from Roman catacombs. The complex was suppressed in 1810, at which time 38 nuns were resident. The Cavanis moved here from Spirito Santo in 1811 and then Canossian nuns moved in in 1863, and they remain here. The complex has been used as a teacher-training college, by various schools, for language teaching, and now as student and tourist accommodation. 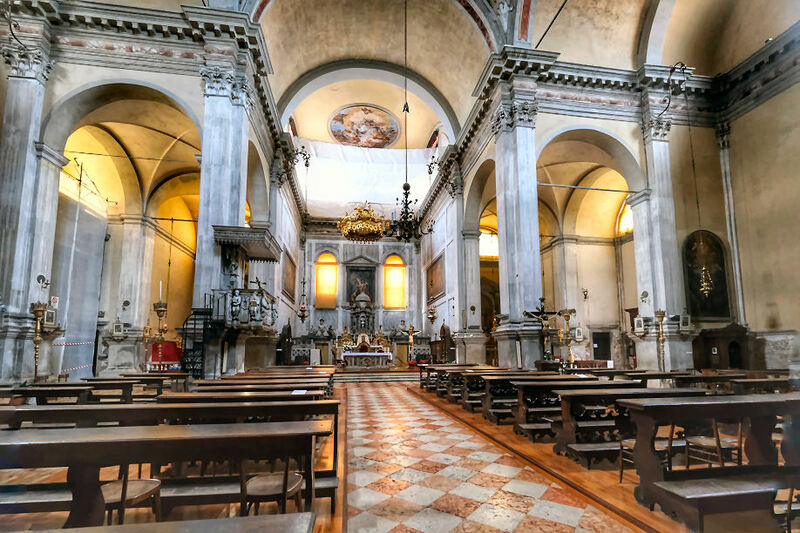 The church was restored in late 1990s by Venice in Peril as it had suffered severely from damp. The work was described as 'stabilising and consolidating the altars'. Also at this time the Fondation Jean-Barthélémy, and others, paid for the restoration of paintings in the church in memory of the painter Marie Thérèse Krafft, who lived nearby. This restoration work, on four wall paintings by Francesco Pittoni of The Miracles of St Augustine, was completed in 2002. More restoration work took place in 2008/9. When I wrote to the Istituto Canossiano in 2010 asking if I could have a look inside I was told that that 'at the present the church is being restored, and is not possible to enter'. A visitor in 2014 was told the same thing. 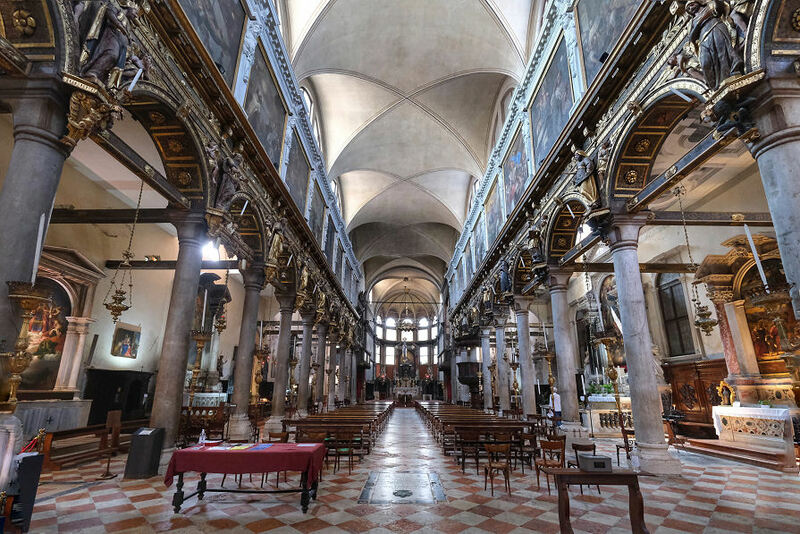 Described as 'rich and sumptuous' in Franzoi’s Le Chiesa di Venezia, the church consists of an aisleless nave, divided in two by the altar with an enclosed choir behind for the nuns. There are ceiling paintings, including The Crowning of the Virgin by Niccolò Bambini, returned now after recent restoration, and 15th century wooden choir stalls with an unusual gilt and polychrome relief carving of The Madonna of the Misericordia in the choir behind the altar (see photo by Val de Furrentes right). Has an eight-sided budino (pudding) shaped dome. Opening times Always closed. Which after all that expensive charity-funded restoration work seems something of a waste and a shame. Monks from Siena from the order of The Blessed Giovanni Colombino established themselves here in 1392. In 1423 they built an oratory and cloister dedicated to Saint Jerome. (They had previously occupied the nearby church of Sant’Agnese.) A proper church and monastery were built here by the Poor Gesuati order (as they now called themselves) from 1494, which was consecrated 1524 and dedicated to Our Lady of the Visitation. The order was suppressed in 1668 and in 1669 the Dominicans bought the place and got Giorgio Massari to build the present, much larger, church, beginning work in 1726, to the east of the old church, and finishing it in 1743. 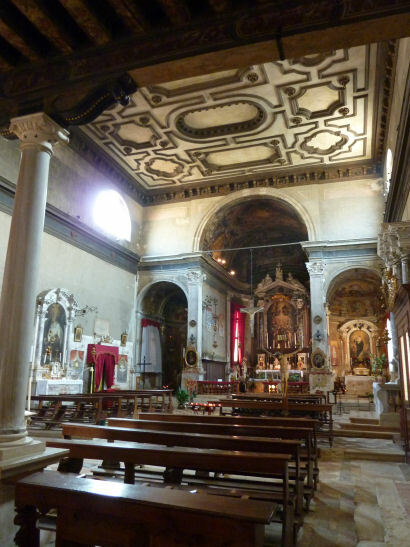 Massari also converted the old Gesuati church (now Santa Maria della Visitazione) to a library. 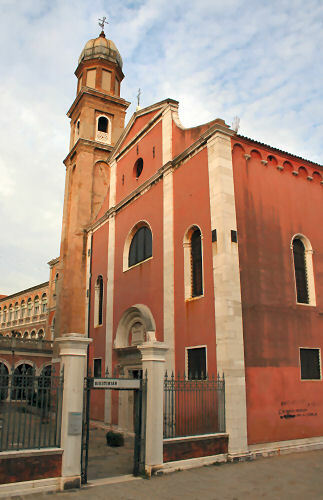 The new church became a parish church when the order was suppressed in 1815, to replace the nearby suppressed churches of San Vio and San Gregorio. The monastery to the left of the church, which become a boys' home after suppression, is now the home of the Istituto Don Orione. This was architect Massari's first major commission in Venice. The niches on the façade (a heavier and more theatrical reflection of the façade of the Redentore church opposite) contain large statues depicting the four virtues. A stone relief of The Dead Christ Supported by Two Angels set into the side wall of the church (seen to the right in the photo right) may be from the original church. The interior, like the façade, is modelled on the Redentore. It consists of an aisleless nave with six connecting side chapels, three either side, full of exceptional 18th-century art. The effect of the walls and detailing is pale grey, getting darker for the domed chancel, with it's unplain tabernacle by Massari. This church is a real treat for Tiepolo fans, with a fine altarpiece in the first chapel on the right depicting the Madonna and Three (female Dominican) Saints (see right) and some Dominic-related ceiling paintings well worth the neck ache, or the easier perusal using the handily provided (and precisely shaped) floor-standing mirror. Also two by Piazzetta, a good one by Sebastiano Ricci, depicting Saints Pius V, Aquinas and Peter Martyr, and a badly restored Tintoretto Crucifixion which came from the nearby Santa Maria della Visitazione. Also by Massari, with a matching parallel tower. The church dominates right foreground of The Giudecca Canal with the Zattere by Guardi. 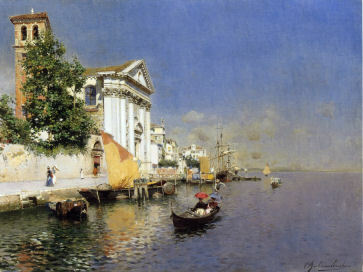 The Giudecca by David Roberts. 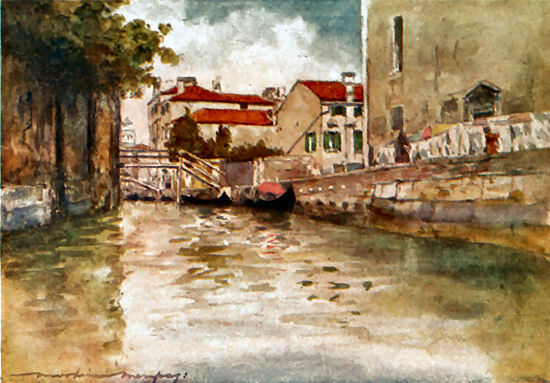 Le Quai des Zattere by Léonce Cordier (1873). Also watercolours by John Singer Sargent and John Ruskin. Santa Maria del Rosario, known as Chiesa dei Gesuati, by Rubens Santoro (see below) has bizarre truncation of the church and the wrong campanile. ...on the ceiling a pretty piece of boudoir painting in the shape of trim, rosy and bare legs; - in brief a work of frigid luxury and costly magnificence. The Italian eighteenth century is still worse than ours. Our works always show some degree of moderation because they preserve some degree of finesse; but theirs plant themselves triumphantly on the extravagant. As Taine was French the last statements provoke a wry smile, at the very least. fencing at ground level and a scaffolding canopy over the entrance. This type of construction is usually just to keep tourists away from crumbling stonework, and so it'll presumably remain until some actual work finally gets going. Founded by Cistercian nuns from the convent of Santa Margherita on Torcello who moved here because it was a more salubrious location. They brought their own paintings with them, amongst them a Palma Giovane. They probably occupied an existing house initially, having a small wooden church built for them in 1472. Their finances would've improved after they acquired a miracle-working image of the Virgin. The church was rebuilt enlarged from 1505 to 1520 and consecrated in 1586. The length of time taken was probably the result of the nuns' poverty causing slow and often-interrupted work. The complex was suppressed by the French in 1806 and stripped of its art. In 1820 the convent became a girls' school, and then an old people's home later in the 19th century. It was a hospital after this and is now part of the Universita Ca'Foscari. Aisleless with a ceiling divided into compartments where small paintings might be, but aren't, this is a small and plain and very used convent church with a big nuns' gallery at the back (see photo below) taking up almost half the church’s length, with two altars each side. The apse and its two side chapels have frescoed ceilings, and for these alone I'd recommend a visit. Paolo Veronese's spectacular Coronation of the Virgin, from the high altar here, is now in the Accademia. It's dating coincides nicely with the church's completion in 1586. Attributions to Veronese’s workshop are common but there are preparatory studies by the man himself at Christ Church Oxford (Christ Church) and elsewhere. He was also commissioned to paint organ shutters for this church around the same time. These show The Adoration of the Magi and The Fathers of the Church and are now in the Brera in Milan, the city which Napoleon intended to make the capital of his new Kingdom of Italy, primarily to annoy the Venetians. An episode of the German TV series based on Donna Leon's Brunetti novels, called Beastly Things, features the gateway pictured (right) as the entrance to a fictional hospital. The Pio Loco was founded in 1557 and had previously been sited in San Marcuola and Santi Apostoli. It moved here in 1571, building on land provided by Andrea Lippomano. It may have moved here to cater for the increased number of patients at the hospital of the Incurabili after the battle of Lepanto. The institution cared for slaves and prisoners of war captured during foreign campaigns. It's more covert purpose being to convert 'infidels' (Muslims and Jews) to Christianity ready for baptism and subsequent citizenship. This task had previously been undertaken by families, who would take in potential converts and guide them through the process. The complex was rebuilt in 1727 by Massari (the year after he completed the Gesuati above) based on Palladio's Zitelle, with a central church (San Giovanni Battista) flanked by two blocks of accommodation. It later became a nursery school, but now houses the Istituto Suore Salesie. 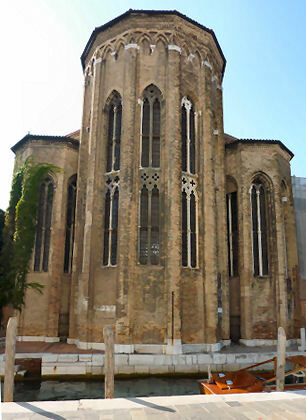 This church was converted from a warehouse previously belonging to the Venezia-Murano Glass company and bought by Sir Henry Layard. He donated it to a committee which had been set up to establish a permanent English Church in Venice. The church opened in 1892, built to a design by engineer Luigi Marangoni, with sculptures by Napoleone Martinuzzi. It contains the tombstone of Consul Joseph Smith, which was moved here from the Protestant burial ground on the Lido, where he had been buried, in 1968. There's also a window commemorating Robert Browning who allowed Anglican services to be held in the Ca’ Rezzonico during the time he lived there. It is one of seven stained-glass windows here recently restored with the help of Venice in Peril. The church was closed from 1935-45 and then after 1945 reopened as a garrison chapel. Public services were later resumed for the Summer season. During his chaplaincy of 1967-74 Canon Victor Stanley resumed year-round services. The original monastery and church on this site, dedicated to The Holy Trinity, was given by Venice to the Teutonic Knights in 1256 in gratitude for their help in the war against old rivals Genoa. Suppression by Pope Clement XVI followed in 1592 and the complex returned to the patriarchate of Venice. The church’s dome with its crowds of angels and its famous huge volutes cannot be said to make a small impression. 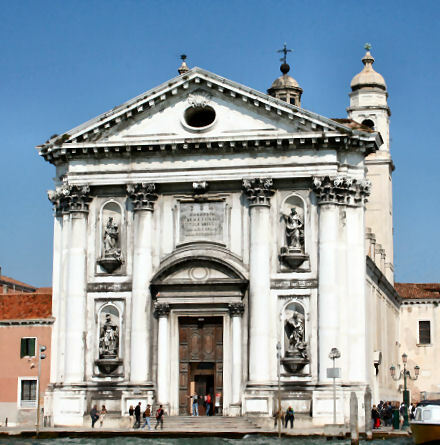 And the building needed to impress, as it formed the centrepiece of the grand annual ceremony where the doge crossed the canal on a specially-built bridge of barges and processed through the central arch to give thanks for Venice’s deliverance. The ceremony continues to this day, without a doge, but with crowds buying sweets and candles and streaming across the rickety structure. In the 1930s it did collapse, with Sir Osbert Sitwell on it. The church long symbolised Venice’s triumph over adversity and its republican strength, just as its silhouette now symbolises Venice in almost every film and TV programme that gets made about the city. An extravagant display, made up of eight Palladian façades, with the grandest facing onto the Grand Canal, up thirteen steps. Huge buttresses with orecchioni (big ears) support the drum of the dome and lots of statues of saints and angels. The lantern on top of the dome supports a statue of the Virgin blessing the city. Behind there's the smaller dome over the sanctuary and two relatively delicate campanili. The interior is impressive but restrained, given the church’s exuberant exterior – a quite plain octagonal space with an ambulatory and six radiating chapels. 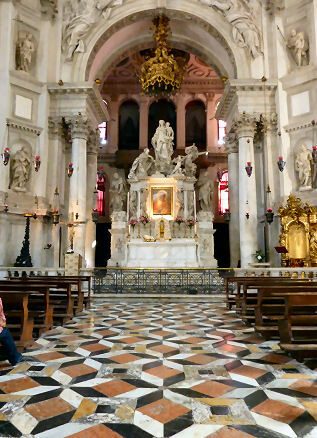 The high altar is by Longhena. The paving is said to be inlaid with 33 roses symbolising the 33 years of Jesus's life. Many works by Titian, all taken from the demolished church of Santo Spirito in Isola. Supposedly his first altarpiece, Saint Mark Enthroned with Saints Sebastian and Roch and Cosmas and Damian, was painted during the plague year of 1510-11. The Pentecost altarpiece is later, having been commissioned in 1529/30 and installed over Santo Spirito's high altar in 1541, it had to be replaced with a second version is 1545-6 as the original's paint deteriorated rapidly. 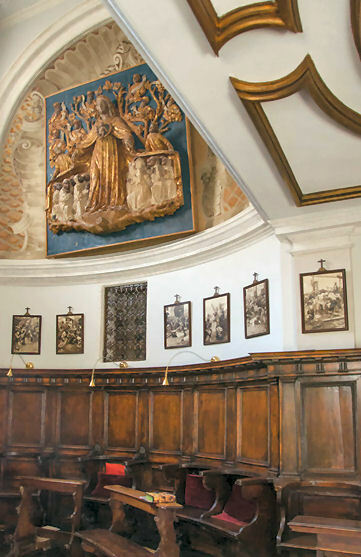 The three ceiling panels depicting Old Testament stories which are now in the sacristy were painted for a commission originally given to Vasari. The skies in all three date to 17th century repaintings of lost pigment, with added clouds. They depict The Sacrifice of Isaac, Cain and Abel, and David and Goliath. The last one was removed and restored in 2010 after water sprayed by firemen tackling a fire at the Seminario next door leaked in though the roof. Also eight portrait roundels in the ceiling of the choir depicting The Four Evangelists and The Four Fathers of the Church. There's also a huge Jacopo Tintoretto Marriage at Cana in the sacristy, dated 1561 it was painted for the refectory of the Crociferi, the complex previously on the site of the Gesuiti. It's the only feast scene that he painted for a refectory, despite his being responsible for at least nine Last Suppers. It was restored in 2016, during which work it was discovered to have been painted in egg tempera rather than oil, and was returned here in November 2017. 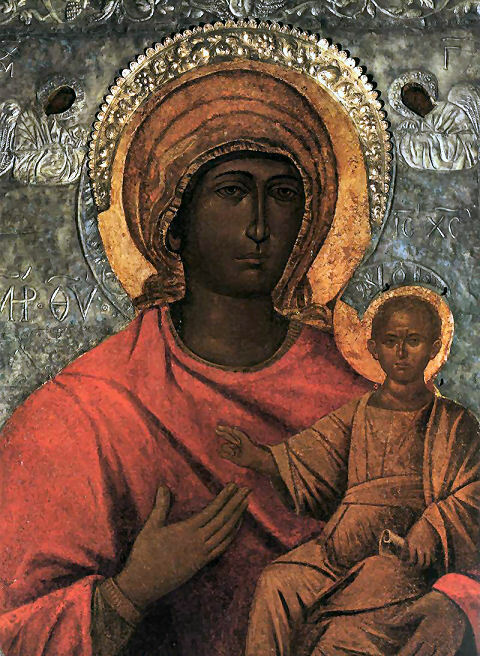 A Byzantine icon of The Virgin Mesopanditissa (see right) said to have been painted by Saint Luke and to have worked miracles, from the 12th or 13th century, was brought here from Crete in 1669 after the fall of the island to the Ottomans. 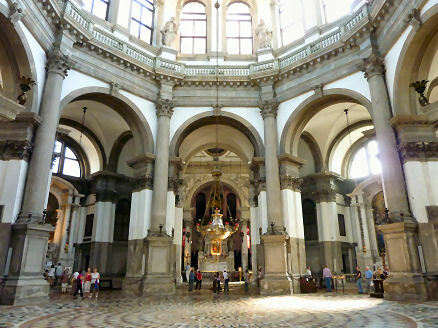 It's set into Longhena's somewhat congested high altar. Two towers, but only one of them has bells. One of the earliest buildings of the Grotesque Renaissance, rendered impressive by its position, size, and general proportions. These latter are exceedingly good; the grace of the whole building being chiefly dependent on the inequality of size in its cupolas, and pretty grouping of the two campaniles behind them. It is to be generally observed that the proportions of buildings have nothing whatever to do with the style of general merits of their architecture. An architect trained in the worst schools, and utterly devoid of all meaning or purpose in his work may yet have such natural gift of massing and grouping as will render all his structures effective when seen from a distance: such a gift is very general with the late Italian builders, so that many of the most contemptible edifices in the country have good stage effect so long as we do not approach them. 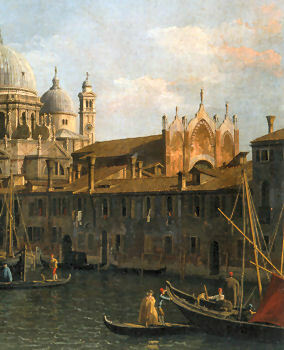 The Church of the Salute is farther assisted by the beautiful flight of steps in front to fit down to the canal; and its façade is rich and beautiful of its kind, and was chosen by Turner for the principal object in this well-known view of the Grand Canal. The principal faults of the building are the meagre windows in the sides of the cupola, and the ridiculous disguise of the buttresses under the form of colossal scrolls; the buttresses themselves being originally a hypocrisy, for the cupola is stated by Lazari to be of timber, and therefore needs none. The sacristy contains several precious pictures: the three on its roof by Titian, much vaunted, are indeed as feeble as they are monstrous; but the small Titian, "St. Mark, with Sts. Cosmo and Damian," was, when I first saw it, to my judgment, by far the first work of Titian's in Venice. It has since been restored by the Academy, and it seemed to me entirely destroyed, but I had not time to examine it carefully. ...and then came Venice. As he landed on the piazzetta a cup of beauty was lifted to his lips, and he drank with a sense of disloyalty. The buildings of Venice, like the mountains of Crete and the fields of Egypt, stood in the right place, whereas in poor India everything was placed wrong. ...but oh these Italian churches! San Giorgio standing on the island which could scarcely have risen from the waves without it, the Salute holding the entrance of a canal which, but for it, would not be the Grand Canal! Amongst the many views are all the usual suspects (Canaletto, Guardi, Marieschi, Turner) but perhaps the most famous are by Sickert and Sargent. They both had a thing for oddly cropped views, like the one by Sargent (see right). Frank Brangwyn painted the church too. Founded in 809, the original church burnt down in 1105 and was rebuilt, and consecrated on the 6th of December 1350. The current church dates from 1749-76 and is by Lorenzo Boschetti, a follower of Massari. His façade is another Greek temple front, based on Massari's nearby Gesuati, but heavier and with even beefier columns. A couple by Palma Giovane. Also a ceiling fresco by Constantino Cedini, a follower of Tiepolo. A quite-recently restored Holy family with the Infant Saint John (brought here from the Maddalena church in Padua in 1774) which some, Bernard Berenson included, have attributed to Veronese, was more recently moved to the Carmini, where it is now confidently labelled as a work by Veronese. Brickwork with a pine-cone shaped steeple. The original 11th century tower was rebuilt in Gothic style in 1350 and restored in 1882 by Lodovico Cadorin. The cheapness of the rents in the area around the church lead to its colonisation in the 18th century by nobles who had ruined themselves through extravagance, and who where thus called the Barnabotti, in honour of the area. They were supported by the state and their daughters were accorded begging privileges. The church featured in Indiana Jones and the Last Crusade - our hero finds catacombs, rats and dead Crusaders under the floor and later emerges from a manhole in the campo. Katherine Hepburn fell into the canal in front of this church in Summertime and the shop where she finds the red glasses, and her love interest, is to the left of the façade. It's now a toy shop. Maschere à San Barnaba by Italico Brass (see far right) the painter father of the famed pornographer Tinto Brass. 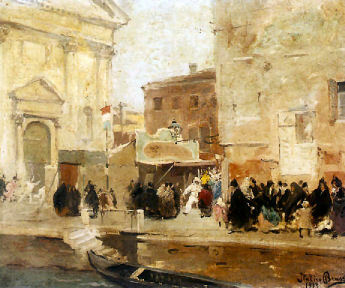 Sortie de messe à San Barnaba by Julien Gustave Gagliardini (1912). The church used to be mostly closed, but is currently open 9.30 - 7.30 daily due to a 'temporary' exhibition of models of Leonardo's machines which has been here for many years now and shows no sign of ever leaving. (Find details here.) But there's a lot of scaffolding and display stuff inside, which makes appreciation of the actual fabric of the church pretty much impossible. Founded in 806 and given to Benedictine monks in 989, who founded an abbey here in 1160. The current church dates from the mid-15th century and is by Antonio di Cremona. It's closely modelled on the nearby church of the Santa Maria della Carità with its three-part Gothic façade, but has long since lost the finials that the façades shared, visible in the detail from the Canaletto painting (see below). Has a triple-apse (see below right) facing onto a canal at the rear. 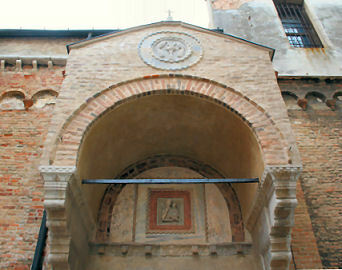 Built into the façade of the canonica to the right of the church’s façade is an arch from a 14th-century funerary monument, visible in the film still below. The skin of Marcantonio Bragadin, who had been flayed alive by the Turks in 1571, was kept here before being moved to San Zanipolo in 1596. The complex was suppressed by the French in 1806 and the buildings were turned into a metal-refining workshop for the Zecca (the Mint) in 1818. It was later used as a hotel and a magazine. 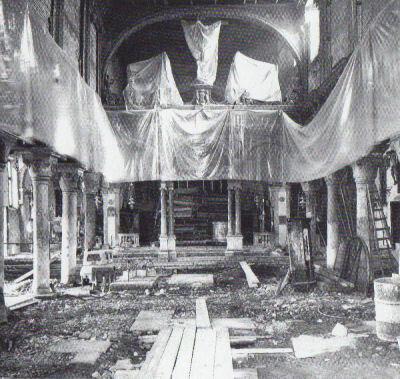 In 1919 it was 'restored by an antiquarian', but fell into a sad state of disrepair in the mid-20th century when plans were made to make the church into a concert hall. 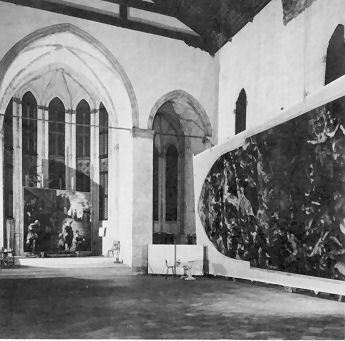 In 1968 it was restored and became home to an art restoration laboratory funded by private rescue committees from across Europe and the USA. This all being prompted by the flood of 4th November 1966. 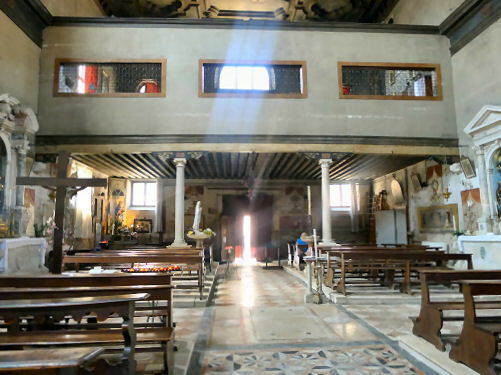 Their first big job was the Tintorettos from the Madonna dell'Orto (see interior photo below left) then getting much restoration attention. Palma Vecchio is said to have been buried here in 1528. 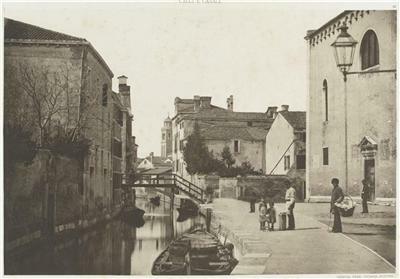 Adjoining, with an entrance (attributed to Bartolomeo Bon) facing the Grand Canal. Admired by Ruskin, it's all that remains of the abbey, which had two cloisters until one was demolished in the late 19th century. In the early part of the 20th century the remaining cloister was let as tenements (see photo below right) but it has recently been spruced up and used for art exhibitions. A late 14th/early 15th-century portable altar, now in the Accademia. An important church of the fourteenth century, not desecrated, but still interesting. 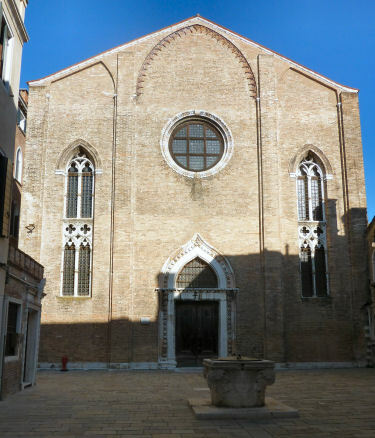 Its apse is on the little canal crossing from the Grand Canal to the Giudecca, beside the Church of the Salute, and is very characteristic of the rude ecclesiastical Gothic contemporary with the Ducal Palace. 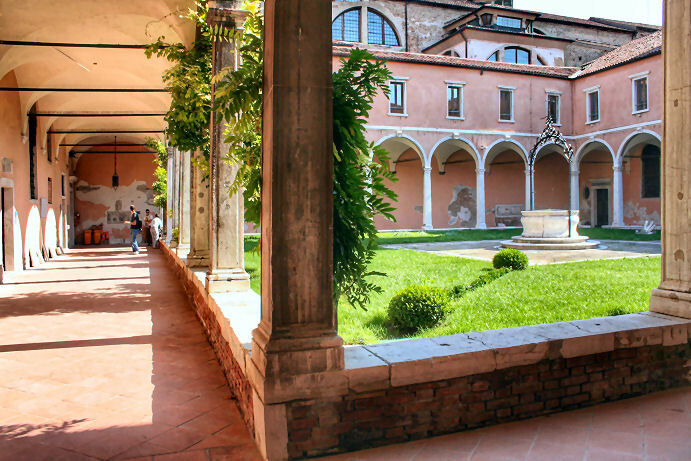 The entrance to its cloisters, from the Grand Canal, is somewhat later; a noble square door, with two windows on each side of it, the grandest examples in Venice of the late window of the fourth order. The cloister, to which this door gives entrance, is exactly contemporary with the finest work of the Ducal Palace, circa 1350. It is the loveliest cortile I know in Venice; its capitals consummate in design and execution; and the low wall on which they stand showing remnants of sculpture unique, as far as I know, in such application. 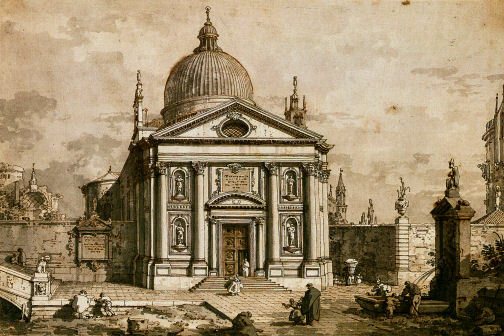 The Entrance to the Grand Canal... by Canaletto (see detail right) shows the church with the façade's original embellishments. features in Who saw her die? Now used by art restorers. restored in San Gregorio in the late 1960s. 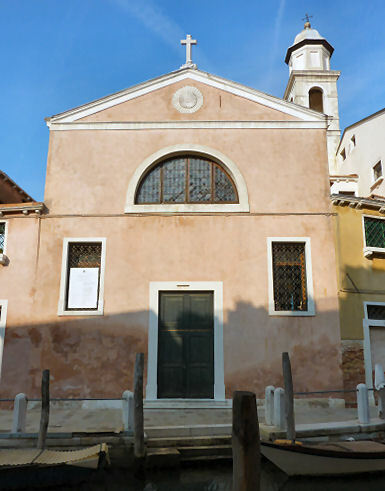 The area around this church is thought to have been one of the first parts of Venice to be settled, being so close to the mainland, and tradition says that the first church here, dedicated to Saint Lawrence, was built in the 7th century by Paduans fleeing the Langobards. 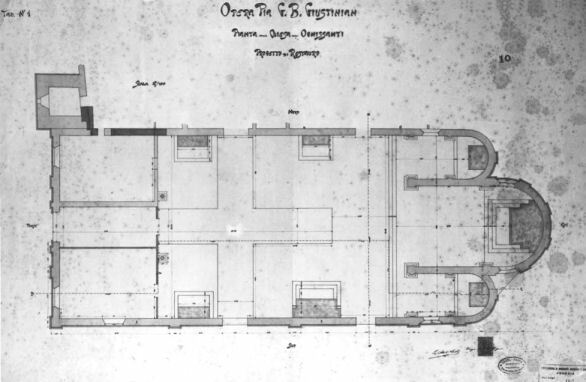 (Although some books say that this building may have been a military structure.) Recent restoration work found the foundations of this earlier church and discovered that it became Greek-cross shaped in the 8th century. Fire destroyed this original church in 1105 and the current church was built. In the late 12th century it was dedicated to Saint Nicholas of Myra. The name 'dei Mendicoli' means 'of the Beggars', reflecting the area's long history as home to Venice's working classes, traditionally fishermen and their families. The church was restored in 1361-4 and remodelled in 1553-80. The last major changes were made in 1750-60 when the new Istrian stone entrance façade was created, perhaps by the Roman architect Paolo Posi. A priest was imprisoned for not being able to say where the money for this 18th century rebuilding came from. It was said that a hoard of Roman gold and silver coins had been found under the campanile. This story also adding weight to the one about the church being built on the site of an ancient temple. Venice in Peril carried out major restoration work from 1967 (see black and white photo below right) including re-roofing, damp-proofing, work on paintings and crucifixes, and the raising of the floor, which was 30cm below canal level. The creation of the present, somewhat baroque, Greek-temple-front side entrance (see photo below right) resulted in restoration work on the old 15th-century porch (to the right in the photo above right) which was once a common feature but only this one and those at San Giacometto and Torcello Cathedral remain. It was rebuilt in 1903 using bits of the 12th-century building. Poor and virtuous women were allowed to shelter and sleep here. 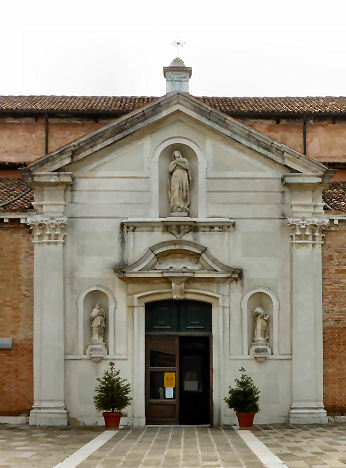 The newer entrance has statues of the Virgin (centre) and Saint Anthony of Padua and Saint John of Nepomuk (flanking the door). A nave with two aisles, the 12th-century basilica plan features two colonnades of columns with 14th-century capitals surmounted by rows of statues of the twelve apostles dating from the 16th century. The three-arched screen between the nave and the sanctuary gives the impression of aisles on three sides and the three deep chapels in the right aisle make for a pleasing asymmetrical impression, so it's this spatial interest that appeals here, and the atmosphere generated by the darker upper parts. The paintings, mostly 17th century, feature no big-names - even the Marieschi painting is labelled 'attrib' and there are a lot of anonime works. There's varied and attractive painting on all of the chapel ceilings, though; and do put a Euro in to illuminate the place - it cuts down on some of the shadowy atmosphere but makes it much easier to appreciate what you're looking at. Even more of a mixture of periods and styles than usual, then, but a pleasing effect nonetheless, supposedly based upon arcane numerical harmonies. Dates from the 12th-century building. The clock was added in 1764. Damaged by a stray bomb in WWII. Also benefited from the restoration work by Venice in Peril in the 1970s. This is the main church that Donald Sutherland is restoring in Don’t Look Now.